Ireland's brewing industry has a long history going back to medieval times and beer fast became the island's national drink. Nowadays Ireland has one of the highest beer consumption rates in the world and ranks 4th in Europe. 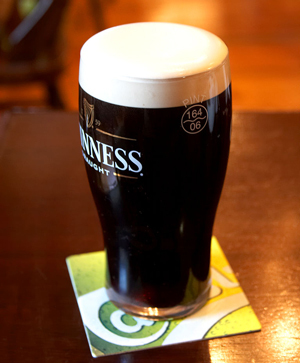 The most popular beer is stout and the most famous stout is Guinness brewed in Dublin. Like all beers Guinness is made from barley, hops, yeast and water. Hops must be roasted before brewing them. Black and Tam : Guinness and a lager or pale ale. Black Velvet: Guinness and champagne. Purple Meany: Guinness and a bitter. Drop of Diesel: a shot of Guinness in a pint of Smithwicks. Beer has a deep ruby colour and must be served with a thick head of foam on top. The celebrated Irish stout is a perfect accompaniment to Ireland's traditional cuisine, especially cheese, meat dishes and seafood. It is known as the wine of the country, the dark stuff, the parish priest or the blonde in the black skirt, but above all as the essence of good living. In Ireland there are a number of other excellent Irish beers: in Cork Murphy's and Beamish make stouts that have their distinct flavours; in Kilkenny Smithwicks is the local ale with a particular slightly hoppy flavour. There are also a number of other Irish craft beers that have recently come on the local markets spread all over Irish countries. County Mayo has its first microbrewery in Islandeady, Oileàn Eadaigh West Mayo Brewery. This microbrewery is the first brewery making beer on a farm in Ireland. Its beers are served in many pubs and restaurants in the main Mayo's towns.